Great runs in Thailand's blockbuster weekend! Two amazing events on the same weekend is always a tough choice for runners and event contributors, but in Thailand it is a particularly hard nut to crack. Both Singha Ultra Trail Chiang Rai and Compressport Ultra Train Nan rank among the very best events in the Asia Trail Master Championship and together bring more than 3000 runners to the trails of northern Thailand. A sign of the great possibilities for the development of the trail scene in the country. All the known Thai protagonists took part in one of the two events. Sanya Khancai won the 122km race in Chiang Rai, Pharait Varesin was unchallenged in winning the 109 km in Nan and Jay Jantaraboon opted for a solid 38k training run in Chiang Rai as preparation for a main goal of his coming next month. In Nan, a lot of attention went to the ladies’ race featuring Ruth Theresia from Indonesia, who could beat the all-time ATM victories record set by Tahira Najmunisaa. But Theresia will need to wait a bit longer for her 11th race win. As it happens, Ruth is a woman and Nan’s race day was on that one day a month. The Bandung Explorer runner who is about to be crowned ATM champion when it is a mathematical certainty end of November, still tried to compete with Thailand’s emerging Waroonluk Chuenjit at first. As she struggled with pains more and more, she let go and just focused on finishing the 109k distance - another Grandmaster point for her. And guess what: it’s her 15th Grandmaster point - more than anyone else in the ATM circuit - and that’s another level completed. Ruth Theresia is any case the first three-star Asia Trail Grandmaster! One of Ruth’s contenders for the ATM Championship, Carole Fuchs, virtually admitted it will be very hard to still catch her on points this season. Fuchs has recently moved to Tokyo, which has had a serious impact on her training and as such she opted for the 50k in Nan. She won comfortably, but the 50k offers no championship points. The men’s race in Nan was won by Pharait Varesin, after his DNF last year when Sanya Khancai proved to be a little too fast. As the latter ran Chiang Rai this season, Varesin had no match on the tough 109k race. It was his first ever ATM race win as a matter of fact. His winning time was:13:48:56. The podium was competed by his Thai compatriots Perawat Silapaariya and Karan Popaichayon. After Theresia let go, Thailand’s Waroonluk Chuenjit stormed to a by all means impressive victory in the women’s in 19:46:16. That was two hours faster than Duangruethai Pakdeevanissukho in second and Sukanya Tongma. Over in Chiang Rai, Sanya Khancai actually returned to the ATM scene after a long period of forced inactivity due to managerial issues. However, he certainly had not lost his speed in the process as he put the hammer down from the flag-off. Spain’s Salva Rambla, coming off three podium finishes including a race win at Ijen 70k, was immediately put on the back foot in a race that suits his characteristics. The pace was fast initially and no fewer than 9 runners were staying close to each other for about 30 to 40k until gaps began to widen. Khancai wasn’t waiting for anyone and Rambla began to suffer from the heat on what was indeed turning out to be a smoking hot day in Chiang Rai’s huge nature park. Meanwhile, Singapore-based Britain Gordon Parkinson was keeping a consistent pace and gradually moved up the leaderboard as others, such as South Korea’s Sungsik Joh, were fading away. Also the 100k winner at Ijen last month struggled with the extreme temperatures. Late in the afternoon, Salva Rambla even decided to retire. He had just been passed by Parkinson and suffering not only from heat but also from a nasty blister. With Rambla out, Khancai had an hour advantage over Parkinson with 27k to go to the finish. The British runner, in his second Asian outing, did remarkably well to maintain more or less the same pace as the Thai leader. But coming closer seemed impossible. Khancai grabbed his third career ATM victory ahead of Parkinson and the Thai duo of Narin Kongsiri and Thongcai Wonsgaard. The women’s 122k race was won by Hong Kong’s Cheng Yinkwan, ahead of Singapore’s Janelle Seet and Thailand’s Pakanee Burutphakdee. The DNF rate on the 122km was very high with just 17 official finishers out of 110 starters. It is testimony to the underestimated nature of the course, which has 5500m of elevation gain. Not nothing, but not out-of-the-ordinary for Asian standards neither. It was in any case interesting given that there was also an extreme trail race on the UTCR programme with a higher finisher rate percentage-wise. The Ultimate 230 km made a huge loop around the Singha Nature Park with a large section along the Myanmar border in the north of it. A unique challenge that was taken up by 40 registered runners, of whom 34 effectively started. It was perhaps no coincidence that two 2-star Grandmasters were among them: Aleksis Capili and Lily Suryani. Capili hadn’t been seen on the ATM tour since last year’s UT Panoramic (which won’t take place in 2018 but returns re-designed in 2019) as the Thailand-based Filipino shifted his focus to better and targeted training rather than more racing. 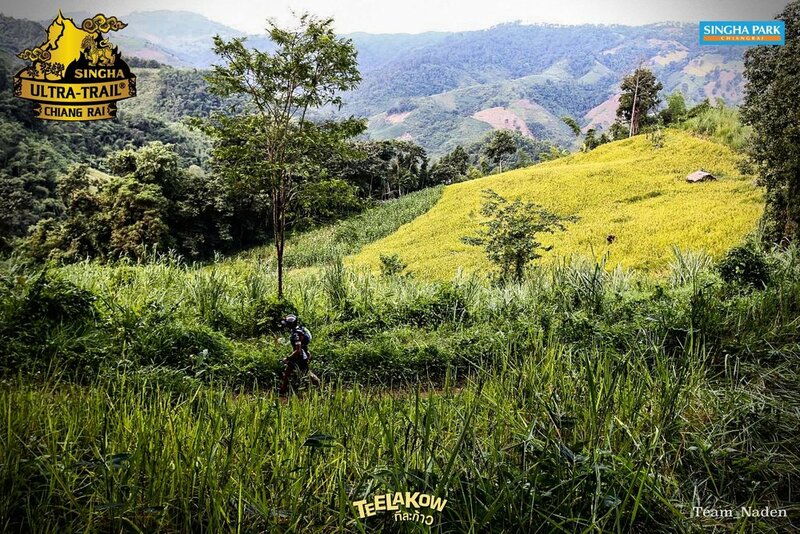 Capili’s race positions have indeed been improving since he adopted this approach, and in Chiang Rai he was taking the bull by the horns in the early part of the double ultra race. Capili was joined at the front by his compatriot Jag Lanante, Brunei-based Canadian Michael McLean and a local black dog, who accompanied the front runners for 86 kilometres! The dog became a star during the event, as the day after he also ran the 38 km race (as Jag Lanante would do as well…).At around km 55, Capili began to feel pain in his knee, and had to slow down the pace. McLean also had his issues. Severe stomach and belly cramps forced him to even retire in the evening of the first day. All that meant Jag Lanante was able to take over and control the race from then on. Also from Philippines originally, Lanante is known as an ultra runner for whom no distance is too long. He actually kept on moving all the way and finished back in Singha Park in just over 37 hours! Capili walked and struggled his way to the finish twelve hours later. In third and fourth were Thailand’s Supeeraphan Sreeduangjan and Korea’s Kwanghoo Lee. The big question trail runners have: will they again be on the same weekend in 2019? 2-star Grandmaster Lily Suryani completed the Ultimate 230k, but unfortunately outside the COT. Ruth Theresia is a woman and UT Nan was on that one day of the month.. Still, she completed the course and became the first 3-star Grandmaster! New name from Thailand to watch out for: Waroonluk Chuenjit!